To celebrate the June 2nd launch of ‘Unicorn in New York II: Louie Takes the Stage’ (the second book in my ‘Unicorn in New York’ series) I’m offering readers the opportunity to name a character in the third book, ‘Unicorn in New York III: Louie in a Spin’. You can name him/her after yourself, a friend, a member of your family, or simply come up with something weird and wonderful that makes you giggle. After all, in a world where unicorns, trolls and mermaids go to a New York fame academy, nothing is too strange. The competition will run here on Girls Heart Books, on Facebook and in select book stores. To enter, simply share or like this post, or the accompanying Facebook post, and write your chosen name in the comments section. All names from both websites and bookstores will be gathered together for a prize draw and the winning name will be announced here and on Facebook in one month’s time. JUNE 25th. Good luck! I look forward to reading the suggestions. 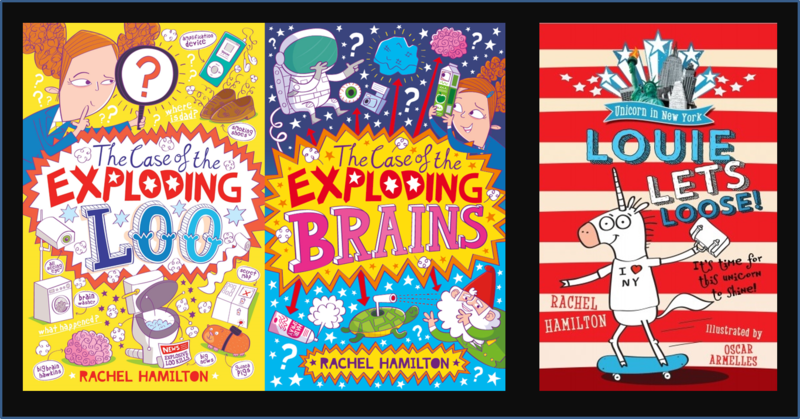 Rachel Hamilton is a graduate of both Oxford University and Cambridge University and has put her education to good use by working in an ad agency, a secondary school, a building site and a men’s prison. Her interests are books, films, stand-up comedy and cake, and she loves to make people laugh, especially when it’s intentional rather than accidental. Her books include the Unicorn in New York series (OUP), The Case of the Exploding Brains, and The Case of the Exploding Loo (Simon & Schuster), which was nominated for the Redbridge Children’s Award, Leeds Book Award, Ossett Riveting Reads Award and won the Worcestershire Awesomest Book Award. Tags: Book competition, Name a character, Rachel Hamilton, Unicorn in New York. Bookmark the permalink. Do you want surnames as well?